WG doing a few adjustments on the Chargin’ Cyclone. Well, well, well…what do we have here? Looks like a picture of the Hi-Risers working on the…Thunderbolt? I think the picture comes from the Detroit Free Press. I posted a pic awhile back of the Thunderbolt they had and thought I had a picture of part of the group. 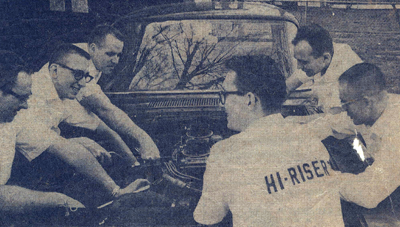 There is also a hand-written note above the picture that states there was another car called “Irritation”. I haven’t seen any references or pictures of that one. 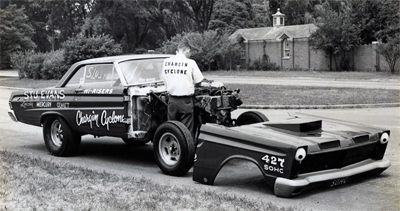 The folks over at Vintage Nitro published a little piece on the A/FX Comet at Detroit Dragway. Perhaps you think of “high risers” in terms of tall FoMoCo high performance manifolds, but when Wayne Gapp stormsout of the hole, high riser means a six-foot wheelie. A low riser would be just a two foot wheelie. 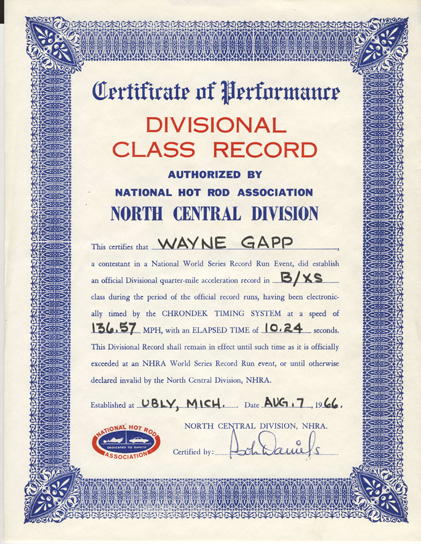 In case you believe that this is just another exhibition machine, Gapp set an NHRA National record in B/Experimental Stock at Ubly, Michigan, with a sizzling e.t. of 10.24 seconds and 136.75mph, running on gas. Being wise in the ways of racing, he didn’t go hog wild in rewriting the record books, he just improved them a bit. This leaves ample margin for running under the record, which he continuouslydoes with times that range from 10.02 on up to 10.05 in four consecutive runs at Cecil County. (He won, needless to say, with a top speed of 138.35 mph.) In Detroit, his home grounds, he goes a bit slower, 10.30 and 136, still well under the record. Now Wayne will be the first to tell you that this isn’t the result of single-handed effort, for the car is the pride and joy of the Hi-Risers Club, a group of Ford engineers with a knack for blending science and pleasure into hot machinery. There are about 12 members on the active list, and they range in specialty from carburetor men to stress analysts (the guys who figure out how to make pieces so they don’t break). Now talent isn’t necessarily synonymous with money, and so the Hi-Risers have decided against the nitro can and the hydrazene. 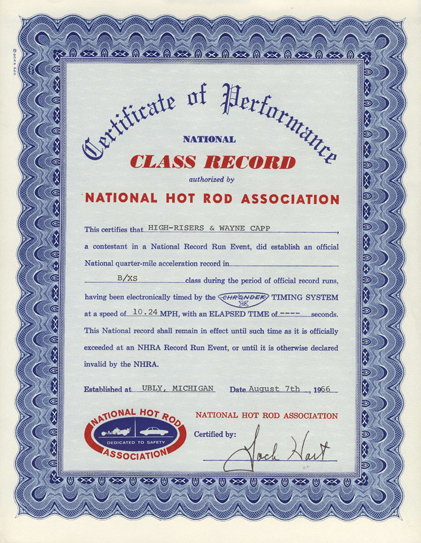 They are content with running gas and setting records with their funny Comet. This Comet, to give credit where credit is due, was built by George Delorean and was part of the Mercury drag racing team in ’65. At the end of the season it changed hands and classifications. 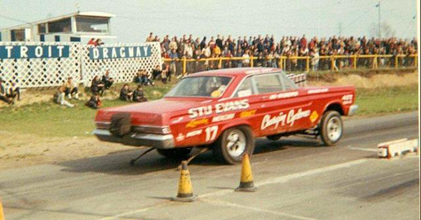 It also changed from an impossible traction problem into a very successful funny car. The Comet was originally built for a stock 115-inch wheelbase but the rear wheels were moved forward 13 inches. The resulting 102-inch wheelbase led to violent wheelies and so the front wheels were moved forward 3 inches and the rear wheels back 3 inches, bringing the wheelbase to 108. We might add that the supports for the rear traction bars are made with two removable extension pieces, so that when traction is needed the rear can be moved forward by discarding the spacers. These simple changes in static weight distribution were enough to transform the car into a winner. The front suspension is pretty unique in its own right and credit for it goes to George Delorean, who installed it just shortly before handing the car back to Mercury. The quarter eliptic springs are clamped to the flat bottom of the frame rails by means of U bolts. The bolt that holds the three leaves together on each side pilots on a drilled hole in the frame. One clear-cut advantage is that the entire front part of the frame was simply discarded, saving considerable weight. In fact the engine now juts out from the front of the car like an air-cooled mill in front of a Piper Cub. It’s very easy to alter the wheelbase and the location of the front axle since all it involves is drilling new pilot holes for the springs and sliding them forward or back. The frame curves up slightly at the spring base and as the springs bend upward they follow the contour of the frame. Simultaneously the free end of each spring shortens and therefore stiffens, so that the pan and pipes are well protected by the increased spring rate when going over bumps on a rough return road. On the other hand when the car rises the effective length of the spring increases lowering the spring rate. This in turn makes the car rise higher and helps get the wheelies started. The chrome moly straight axle was built by Logghe Stamping and fitted with early Ford spindles. It has received some additional reinforcement in the center to keep it from bending up because of the wheelies. In fact one of the problems with using the quarter eliptic springs is that they are placed fairly close together, leaving the unsupported ends of the axle to act with considerable leverage when the car bangs down. In addition to being located by the leaf springs, the axle is also positioned by a pair of radius rods. The steering includes an Econoline steering box fitted with an extra long Pitman arm. A small Volkswagen steering damper prevents the harsh caster action from translating itself into a shimmy. The front shocks are neat looking Autolite raee units which do not offer an up-lock action. The up-locks are avoided for several reasons. First, there are clearance problems and then also the wheelbase has been altered so that starting line traction is not a problem. Then too, for high speed stability it’s better to have the car down rather than up.The front end is fitted with 6.70 x 15 nylon Firestones, that have been suitably worn off on the sides and are run at 50 to 60 pounds pressure. Look into the trunk and you’ll find a pair of 6-gallon tanks, one for fuel and the other for cooling water. This, together with a 100-pound battery, provides ample ballast. Next year when maximum class weights drop from 2600 to 2400 pounds in NASCAR, but remain at 2600 in NHRA, there will be some quick trimming in battery size and cooling capacity. The rear suspension is a reasonably stock Ford racing design with traction bars welded to the axle and its only unique feature is the quick wheelbase change we mentioned above. A pair of airlift bags are run at 15 pounds per square inch and allow quick tailoring of the rear suspension action. The bags will come into their own next year in helping compensate for weight changes between NASCAR and NHRA meets. Considerable science has been devoted to the engine, some of it quite normal and some out of the reach of the ordinary rodder. The engine begins on a budget with the old style single overhead cam block that uses an outside oil return from the heads back to the crankcase. Clearances are just.002 inches on the mains and .0025 on the rods, tighter than most other people run them. The bearings range from Federal Mogul to Cleavite. The Ford block has two oil relief valves, one at the pump and the other one inside the block. This results in a closer control of the oil pressure. Here the block oil pressure has been upped to 100 psi which is quite high and makes it mandatory to use the Ford racing filter. Any other filter would promptly blow up under this pressure. To improve the oiling, grooved upper and lower mains are used. (Grooved uppershells are used both top and bottom) Most drivers have gone to aluminum rods for heavy duty sohc use while the Hi-Risers have stayed with steel rods and learned to make them live, and here comes a bit of science that is unusual. Instead of just torquing the rod bolts and being at the mercy of any errors in torque wrench readings or bolt rig, they are miked to check the bolt stretch. The reason for torquing any bolt is to determine how tightly it goes in, but the final effect of the torquing is to place the bolt under stress lengthwise to increase the clamping pressure and this in turn means stretching the bolt. Since the stretch is directly proportional to the clamping action, the sensible thing is to mike the bolt in its free length before tightening and then keep miking it as you torque down the bolt. These bolts are picked from batches that have been checked and tightened down to close to their yield point (when they begin to stretch). This is fine, we said, but how about the loading that comes on a bolt due to the inertia of the rod and piston? Doesn’t that immediately carry the stresses above the yield point and make the bolts stretch out like tired old rubber bands? The answer is straight science. Since the engine rpm is kept up high, the stresses are applied and removed so fast that the bolt does not have time to yield. Also,not counting idle time, the car accumulates only six minutes of running at 8500rpm in about two months, hence good bolt life. The crankshaft damper was eliminated by similar reasoning-not enough time for the stresses to act. The pistons are also stock Ford which, together with engine blueprinting, bring a 13:1 compression. Slightly deeper valvepockets provide enough clearance so that the cam can be retarded or advanced at will. The pistons have Perfect Circle Molybdenum filled top and second compression rings. These rings are barrel faced for a quicker break-in. The moly, too, seems very desirable in this application because it’s softer than chrome, seats more quickly, doesn’t scuff at high temperatures and is porous enough to carry its own oil supply. One of the things the Hi-Risers found out was that if the blow-by (leakage past the rings) is controlled by the rings, less heat gets down to the ring lands and they don’t cave in. In the tune-up department, you’ll find that the two big four-barrel Holleys no longer have choke plates. A loop of copper tubing bridges the fuel bowl vents to prevent spill-over on acceleration. Also, bigger jets are used in both the primary and secondary barrels. When the throttle is popped, the manifold vacuum is high and the primary venturi vacuum also rises. To prevent the secondaries from just flopping open and bogging the engine, there is a small ball check that modulates the action and slows down the secondaries for more normal street or strip applications. Here, with the engine leaving the line at 5500 to 7000 rpm and going through the lights at 7600 to 8000, there is no need to slow down the secondaries and the ballcheck is removed. The ignition system is the same Autolite transistorized unit that has been used on the Ford GTs at Le Mans and on the Ford Indy cars. It’s a breakerless unit with an 8-pole rotor that triggers magnetic signals and produces a spark that just won’t quit. It also offers an interesting form of engine speed control. Phil Hazen, an electrical engineer who is a member of the Hi-Risers, made up a mechanical drive from the cam to the tach.The face of this tach has a small slot which is fitted with an adjustable stop. If the engine should overspeed, the tach needle pegs against this stop and completes an electrical circuit which cuts the ignition through a relay system. The exhaust header stacks are short and there is no collector, simply because the engine never sees a “low end” in the rpm scale. The Long twin-disc clutch follows the 70 same pattern as those released on the hot Comets last year. Lugs cast right into the flywheel drive the steel floater plate. The pedal pressure is quite low which gives the driver good control and the lightweight solid flat discs do not interfere with the shifting. Also, thanks to the twin-disc design, it’s possible to get away with small 10-inch discs instead of 11 inches, which further reduces the rotating inertia and helps keep shifting easy. To further insure good, fast, snappy shifts, the Hi-Risers have tried two different approaches. One is to cut all the teeth off the blocker ring and also to remove every second tooth from the synchro sleeve and the corresponding teeth on the gears. This increases the chances of completing a shift by more than double since there is ample space for the dog clutch teeth to match. Another system tested by the Hi-Risers has worked out quite successfully and involves less weakening of the parts. Here all the teeth are retained but the shift is made smoother by cutting three new slots in the blocker ring. In a stock machine,the blocker ring is designed so as to make the teeth meet head on and block the shift until speeds are synchronized by the clutch action of the blocker cone. By repositioning the slots, the offset between the teeth is reduced and as soon as pressure is applied,the teeth are ready to slide past eachother. Some blocker clutch action is retained and the shifts are less hard on the teeth. The rear axle carries a 4.86 ratio and a 9·inch ring gear which has given no trouble. It is also equipped with heavy duty 31-spline axle shafts. To stop the machine at the other end of the quarter in the face of speeds that are pushing the 140 mark, the Hi-Risers installed sintered iron linings on the brakes. They are warmed up with a couple of touches before they are fully applied. In fact the stopping distance is short enough so that the chute seldom needs to be used. As usual in a machine campaigned by engineers, there is much thought given to small details, the ones that win races, and,the Hi-Risers are no exception. They also win regularly. Could it be that there is something to all that science?